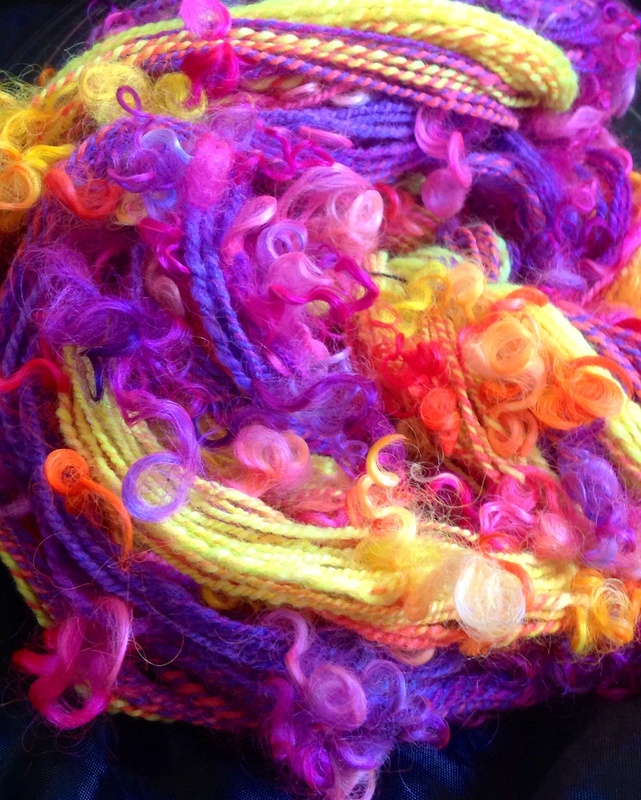 This handspun is made with Blue Barn Fibers polworth/silk rolags in the neon sunset colorway. 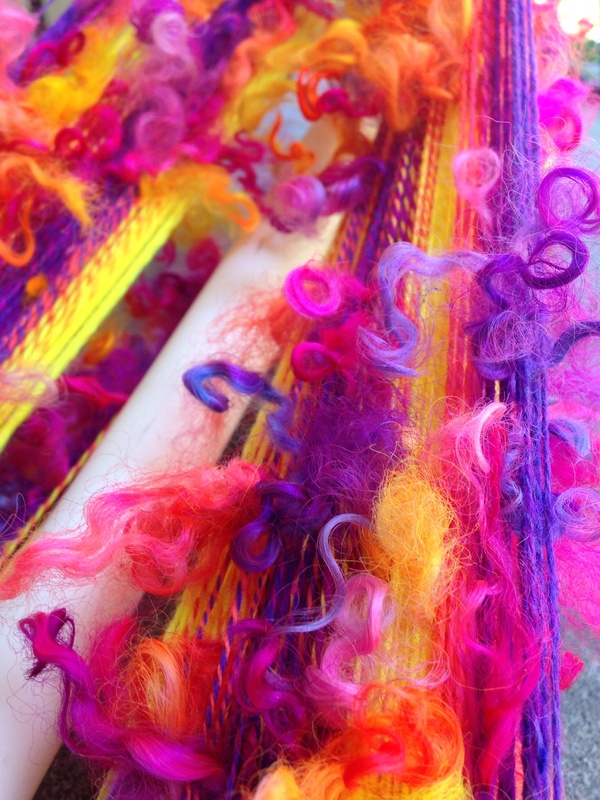 With teeswater curl add ins, also from Blue Barn Fiber, in the neon sunset colorway. I did end up with some barberpoling while plying, however, when woven or knit up I think the barberpoling will help the transition when moving from one color to the next. It is actually pretty finely spun pre soak, which came out to a 13-14WPI off the wheel. Polworth has an amazing way of poofing up after a soak and set. Drying in the sun – that luster in that lock in the middle is indicative of why I love an amazing teeswater… Teeswater top vs teeswater locks, is a completely different experience. I prefer the lock, for sure. 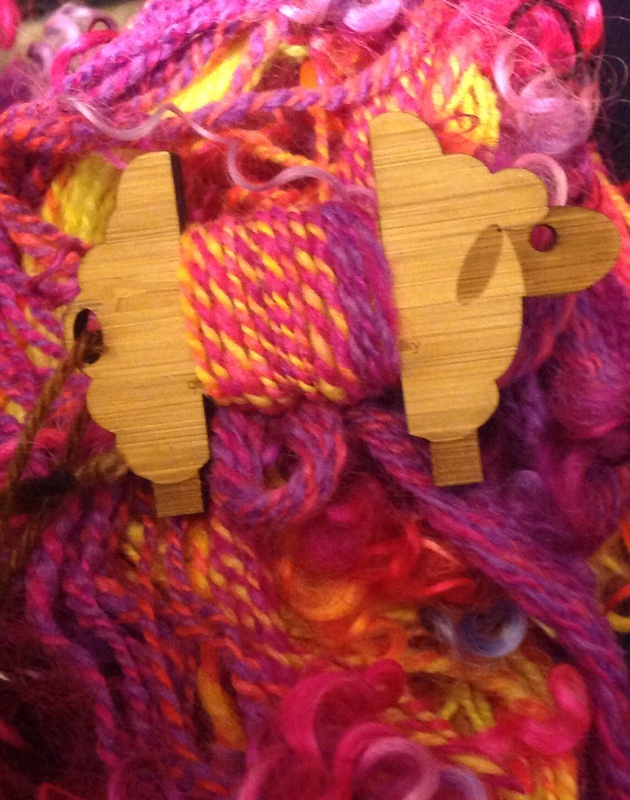 Which ended me up with a 10-12WPI yarn, stuffed consistently with the teeswater locks throughout. I left a long beginning and end to the yarn without any locks. 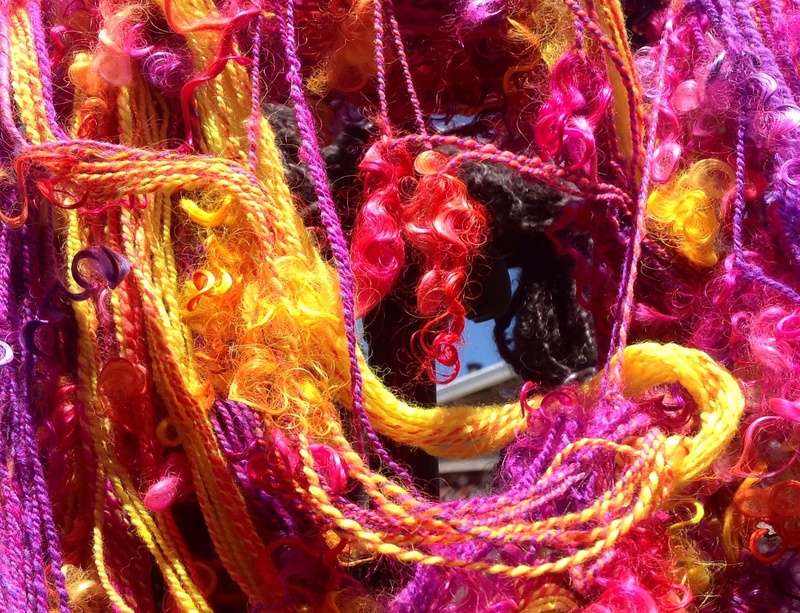 Ultimately, the idea of a thinly woven scarf is what I have in mind for this very special yarn. I love how the colors are so incredibly bright. The purple melts into pinks, into neon peaches once mixed with the tangerine orange, and finally into a bright happy yellow. The way I chose to spin one rolag to the next, matching up the rolags colors, end to end, giving it longer color repeats. I see it being the perfect weft. I ended up with approx 214yards with 2oz of the rolags, and 1oz of teeswater, which didn’t play a part in the yardage the way it was used. I’ll need to practice a little on the loom prior to using such a special yarn, which is fine, as this will give me time to think about a warp. 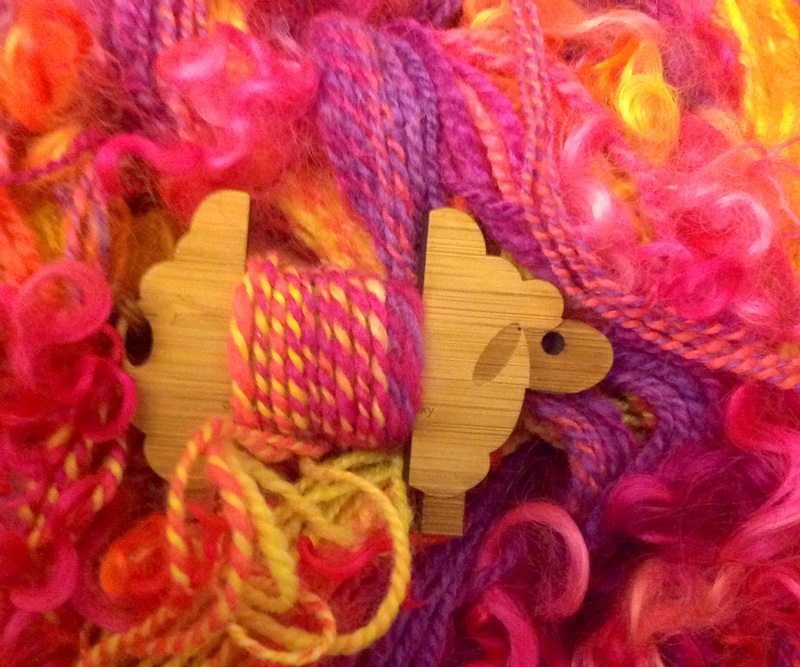 For now, neon sunset special is going to decorate my handspun wall. 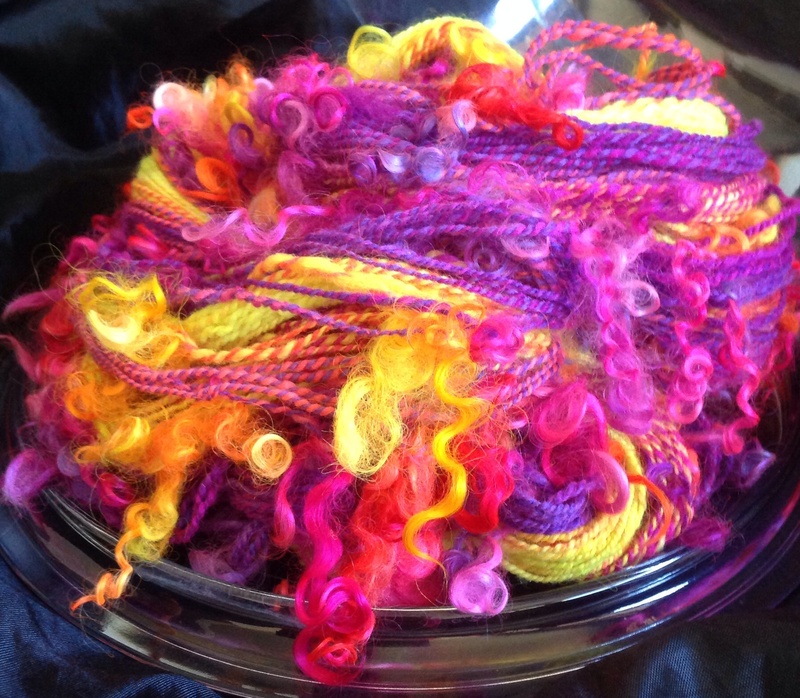 Every time I see it’s bright happy colors, with the matching perfect curls, it just makes me happy, just being yarn, so I’m not in any rush…. Well, not until I have that perfect warp figured out.